JVC GY-HMQ10, 4K Quad-HD 144mbitps pro camcorder for $9000! JVC is now releasing their new JVC GY-HMQ10 professional camcorder below $9000 on the Japanese market (750,000 Yen). It's using the JVC Falconbrid processor as in my JVC GC-PX10 camcorder that I've been using to film all of my CeBIT 2012 videos (using 720p@50fps@12mbitps for faster uploads), all of my OLPC Summit videos (most include direct-download links to the original 1080p@50fps@36mbitps camcorder files), all my LeWeb 2011 videos were also filmed using the JVC GC-PX10. The JVC Falconbrid is one of the new upcoming 4K2K Quad-HD camcorder processors to bring more and more affordable 4K cameras to the market! 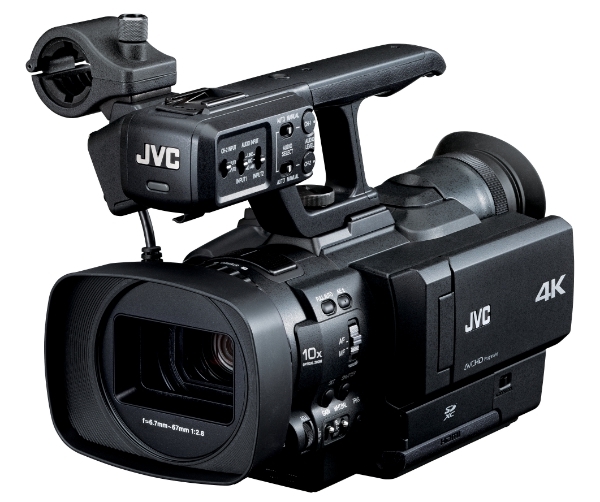 The JVC GY-HMQ10 I think is designed for professionals, but I also think it's possible that sooner rather than later, JVC might decide to provide 4K recording support in the sub-$1000 camcorders also in something like a successor to the JVC GC-PX10, perhaps the sub-$1000 JVC GC-PX20 will support 4K! The main question is how to let it record 4K video uncompressed. The new JVC GY-HMQ10 provides 4 SDXC slots supporting thus 4x 64GB SDXC cards that can thus store 4 hours of 4K 144mbitps video onto those four 64GB SDXC Cards in RAID 0 (256GB) in Apple’s ProRes422. It takes space for 4 SDXC card slots, I wonder if it's possible to provide a slot for 2.5" SSD drive or perhaps even a SATA hard drive, but then the 4K camera has to become bigger in size than the JVC GC-PX10. This sounds like it might be cheaper than the Red Scarlet camera (that seems to need to cost at least $15000 to be able to shoot 4K). Sub-$9000 for 4K start to be getting there. I wonder though if 2012 isn't going to be the year of the first sub-$2000 4K camcorders, as I also think people are going to be able to find affordable 4K 55" HDTVs also from Sharp and others. Chips and Media provides hardwired video codec IP for ARM chip makers, that accelerates and smoothly plays back now up to 2160p video at 30fps for ARM Cortex-A15 processors to be taped out mid-year and possibly released in devices by the end of the year! Now it seems that the 55" OLED screens are ready to be shown publicly for the first time. I prefer 55" or larger 4K LCD TVs though. If they can make the 55" OLED TVs with 4K resolution and sell them below $2000 that would be great! Sharp is about to mass produce a 4K2K 55" HDTV. Their secret sauce is the ICC technology (Integrated Cognitive Creation) which is an upscaling technology, somehow sharpening and adding details to 1080p sources to make them look more amazing on the 4K HDTV. With this, people might want to consider re-watching all their Blu-ray movies to re-experience the same 1080p source files in more amazing quality. That until each of the movies are also available in the native 4K2K resolution on Blu-ray, hard drives, streaming and other potential 4K media. Here's a presentation by one of the lead engineers at Samsung on the 4K2K HDTV project. With some details about the cost of the technology. Here are my predictions for 2012, consider some may still be wishful thinking. Cash and control by the CEOs often trumps the better ideas, inevitable developments are sometimes delayed. - Mass manufacturing of ARM Powered Laptops that have a performance above Intel Atom netbooks, can satisfy most consumers running Android (with full Ubuntu-like Chrome browser running on NDK with lots of RAM), Chrome OS, Ubuntu and Windows 8. In the first half of the year, the processors can be OMAP4460 1.5Ghz, OMAP4470 1.8Ghz, Tegra3 1.3Ghz (higher frequencies if available), i.MX6-Quad, Qualcomm S4, Exynos Dual-1.5Ghz and Quad-core. In the second half of the year those may use ARM Cortex-A15 such as OMAP5, Exynos 5, Project Denver and others already. 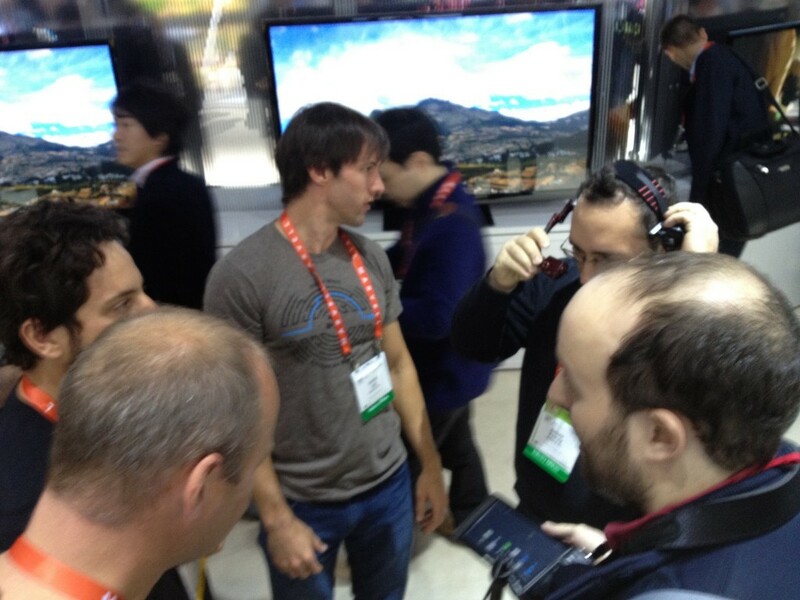 - ARM Powered Google TV will take off. Starting from the HDMI output of every high-end Android phone, dedicated ARM Powered Google TV boxes can sell for as little as $50, can accelerate the adoption of mass market video-on-demand to the HDTV. - The only hope for the HDTV industry is to mass manufacture Quad-HD 4K2K screens at 55" and higher and sell them as soon as possible for sub-$5000 and later sub-$2000 prices. I think that upwards 400 million consumers would consider upgrading their HDTV to 55" Quad-HD type if it can be sold below $2000. Quad-HD content comes from Hollywood as all movies are already digitized in Quad-HD for digital cinema distribution, and with h264 and WebM, Quad-HD movies can fit on Blu-ray disks, 40 4K movies can fit on a 2TB hard drive, 4K content can even be streamed over VDSL, Cable or Fiber to the home Internet connections which those same hundreds of millions of consumers already have or can have for cheap. - White Spaces will create the biggest chaos in the telecom carrier industry as schemes for cheap White Spaces routers will be available, using the http://FON.com method, whole cities can be blanketed with free or very cheap high-speed wireless data. Every ADSL/Cable/Fiber user can connect the White Spaces routers and provide bandwidth for each whole neighborhoods. White Spaces can become the main worldwide standard wireless data network system to replace cellular, LTE, Wimax for the future. - Sub-$100 Android phones will become the most popular smartphone category to be sold during the year. Sub-$100 Android phones will have the performance and capacitive usability of at least a Nexus One phone which was the best high-end phone in the world at the beginning of 2010. Without being too greedy for certain hardware features such as Super AMOLED HD, special metal casings, it is possible that high-end Android can be mass manufactured to be sold mostly for as little as $200-$300 unsubsidized for unlocked no-contract use. Expect some high-performance Dual-core phones with nice big capacitive screens and full ICS experiences to be sold below $200 unsubsidized for pre-paid plans soon for sure. - Over 500 million smartphones to be sold, 90% of those Android. Over 100 million Tablets to be sold, more than 70% of those Android. - Tablets with keyboard docks are basically laptops with touch screens and will replace most laptop sales. There will be fat and thin keyboard docks, some include batteries and ports while other are very thin keyboards that can be fixed magnetically or by hooks to cover the tablet to function as a thin screen protector. Keyboards remains the fastest way to input text and to be productive with a computing device. - 7" Tablets will be the most popular size excluding the keyboard docking tablets. Hundreds of millions of consumers will want to use a 7" tablet in their jacket pockets when going outside. A 7" tablet has a 2x to 3x larger screen surface area compared to a smartphone, offering a better experience for video playback, web browsing, games, apps and more. - Wearable computing will take-off in several areas. From Android wrist watches, to head-mounted displays with augmented reality, to bluetooth headphones, controls that can be snapped to clothing. All can function using Bluetooth to synchronize and use the smartphone or 7" tablet as the brain of the system. The headmounted display system can look like the Motorola Kopin Golden-i which I have used for the past 2 months for augmented video-blogging. Android wrist watches can be used to view notifications and interact with basic functions of Android such as initiating a call, checking updates and other basic features that may not necessitate to pull out the smartphone or 7" tablet from the pocket. - E-readers will be used for more than basic e-book reading. Using the Chrome-to-phone type functionality, users can click on articles on their laptop and have those instantly synchronize or beam to the e-reader, thus offering a secondary screen much more comfortable to use for article reading. Also collaborative real-time annotations will be the most powerful usage of e-readers for productivity in schools and businesses. Upwards more than 100 million e-readers can quickly be demanded as soon as effective collaborative annotation software and cloud services are available using a stylus. It'll be the most popular way to collaborate on writing and reviewing documents for schools and business. - ARM Cortex-A15 will be shown early 2012 with devices available on the market before the end of the year. Expect a performance as high as 4x that of current dual-core ARM Cortex-A9 devices. - ARM Powered servers will be deployed in large deployments, it's possible that Google and other cloud services companies start using ARM servers exclusively in whole new datacenters. - Android@Home will take off, including embedded ARM Microcontrollers in all types of home appliances, in all electrical outlets, synchronizing all appliances with Android. This is the Internet of Things, we're talking Billions of new ARM Powered devices to be sold every year. - Stocks that are likely to collapse: Microsoft, Intel, Nokia, Apple, RIM, HP, Facebook, Twitter, Groupon, Zynga and more. By collapse I do not mean instant bankruptcies, but simply that their value may get halved quickly as soon as investors realize those companies don't have much prospects for keeping the same levels of hype and profit margins that makes their current market cap. - Microsoft does have a chance only if they pivot, it may require a new CEO and new board of directors. They need to stop focusing on proprietary software licencing and they need to use and support Android and focus on making profits on cloud services instead. Microsoft can have the resources to compete with Google on cloud services, it's their only chance to stay highly valuable. - Intel does have a chance only if they pivot, it may require a new CEO and a new board of directors. They need to licence the ARM architecture and use Intel's semiconductor design and manufacturing facilities to try to make some of the better performance high-end ARM Processors, it's possible Intel can make a very powerful ARMv8 and ARM Cortex-A15 variant and that could bring them a lot of business. - Apple will still remain successful but they cannot remain a $376 Billion company. Right now, 65% of Apple's profits comes only from the iPhone. We've already established that it's very unlikely Apple can grow that profit stream from the iPhone as sub-$100 Android phones are to be the most popular smartphone category worldwide. I think it's very unlikely that Apple can find a new cash cow to keep as high level of profits and when investors figure that out, the value of Apple on the stock market can be halved quickly. - Nokia's only chance is to use Android as soon as possible. Same for RIM and HP. But if they insist on being stubborn, they can only go towards collapse. - All software patent lawsuits are all going to be cancelled and dismissed. It is a worthless strategy of Apple, Microsoft and Oracle to try to sue Android companies on bogus software patents. The Android companies combined have many more patents which they can use defensively and are much more powerful than any of these proprietary platform providers regardless of how many patent trolls each of them can hire to try to extract bans, reporting on these patent lawsuits is and will remain a waste of time. All bloggers need to understand that none of these patent lawsuits are at all relevant. Most of these patents can easily be proven to be worthless simply by showing prior-art to the courts, in nearly all cases there is prior-art that can be shown, simply, stop talking and thinking about it. It'll turn out to have been the biggest waste of time for everyone involved in writing and reading tech blogs in 2011. - Google+ can overtake Facebook. All Google+ needs to near-instantly overtake Facebook are some features to filter and recommend items to each user based on the +1 ratings that people can do on Google+ and all over the web. Basically, expect Google+ to replace your Google News, Google Reader, Twitter, Facebook, Techmeme, Groupon, IMDB, Skype, Baboo it even might become the main way to generate personalized YouTube playlists. - Consumer 4K2K Quad-HD camcorders to be sold below $2000 are possible. This may be put investments people have put into Red cameras to risk. Basically new sub-$2000 DSLR and camcorders can include 4K2K Quad-HD video recording simply by using one of the newest processors. - Camcorders may run Android for support for apps such as one-click upload of pictures and video to YouTube and Google+, collaborative video editing, video streaming, title, description, tags editing etc. More and more camcorders and photo cameras will thus include WiFi, a touchscreen and Android. - Google may expand Google App Engine to support PHP/Mysql CMS scripts such as WordPress, phpbb, mediawiki and more. Google can thus provide free ads-free hosting up to millions of pageviews per month and above that, require that people use Google ads or pay a small fee for the cloud hosting bandwidth. Google can guarantee secure backups, upgrades, support and more. It'll be disruptive for the hosting and domains industry. - Some Governments will legalize piracy and make one step further, levy a tax on the ISP or a new tax that every citizen will have to pay to sponsor all artists in each country. For example about $10/person/month for everyone in Europe, the USA and a few other rich regions of the world can collect over $120 Billion per year, which is more than enough to sponsor all music, movies, tv, writers, open source free software programmers and more. Popularity of all works online can reliably be measured to compensate content creators accordingly. This will eliminate existing intermediaries like labels/studios/publishers/proprietary software companies and it is going to be very disruptive towards the new intermediaries like netflix/hulu/spotify/kindle/prime/itunes and other. At the recent CEATEC consumer electronics show in Japan (which I had tried to attend and video-blog at but I did not find a sponsor in time), Sharp, Toshiba and Sony showcased their first consumer-oriented 4K2K screens and projectors, perhaps finally leading up to more 4K2K for the mass market. Eventually more affordable, because Toshiba's 55" Regza 55×3 Quad-HD is announced to be priced at over $10 thousand. Sony's VPL-VW1000ES Quad-HD projector is even more expensive at upwards $20 thousand. Sharp did not yet announce a price for their 60" Quad-HD TV, but they showed what they call their new so-called Integrated Cognitive Creation (ICC) processor for what they claim to be higher-quality Quad-HD upscaling. 4K2K is awesome. And putting it on 55" or 60" screens and in projectors sounds like a good target. They need to sell 4K at sub-$2K. They need to price 4K at $2000 and below and not $10K and they need to mass produce 4K2K as a priority now instead of 3D. On the Internet, the most downloaded 1080p movies are below 10GB per movie. That means 4K movies can be compressed at a below 40GB file size. That means that a 4K movie can fit on a current Blu-ray disc. That means that more than 50 4K movies can fit on a $50 2TB hard drive. There is no 4K distribution problem. YouTube supports 4K streaming at below 20mbitps today. The most downloaded 1080p movies are encoded at below 9mbitps bit rate. That means that a 4K movie can be streamed with a 36mbitps or faster Internet connection (at same "full" quality level per pixel), which more and more people can access today using a regular VDSL Internet connection over copper wires and even faster over the coaxial based network. Millions of consumers already have Fiber internet to the home, and millions more could easily get it. Those people can get 1Gbitps over the connection, that is more than enough to stream any 4K content needed. Hollywood has already digitized most of their 35mm movies to the 4K2K format, which is already becoming the digital standard for Cinemas worldwide. And most of the new movies are being recorded using 4K2K cameras anyways and are already natively recorded in that format. So it would actually be a piece of cake for the film industry to provide every movie ever made in the 4K2K format, easily distributed on Blu-ray, on hard drives or streamed using 36mbitps or faster home internet connections and progressively downloaded using slower connections (if you only have a 20mbitps download ADSL connection, you may wait about half an hour before the 4K movie can start. Or you can get the 3K version at half the bitrate and that still would look 2x better on a 4K display than the same content in the 1080p format). It is very common for all consumers to take digital pictures at 8megapixels or higher. Most new digital picture cameras take 8Mpix pictures or higher today. Even most new high-end smartphones take 8Mpix pictures. put the SD card from those cameras in your 4K2K TV, and for the first time, you can see the full quality of your digital photographs. Just to display your personal photography onto those 4K2K displays wil be worth the enthusiasm, even if you do not have fast enough Internet, even if you can't get a lot of 4K content on Blu-ray or directly onto hard drives, then still just as a picture viewer, the demand for 4K2K is worth it now. Dear TV industry, please stop making 3D now and start mass producing 4K2K screens and projectors now! Get the price down below $2000 as soon as possible, than you.